The explosion happen to the right of the half-finished building across the street corner behind the ambulance. Behind the trees and to the right are two schools that may have acted as militant headquarters On the street is ruble from an earlier strike: the small guardhouse to the left of the school gate has been destroyed. 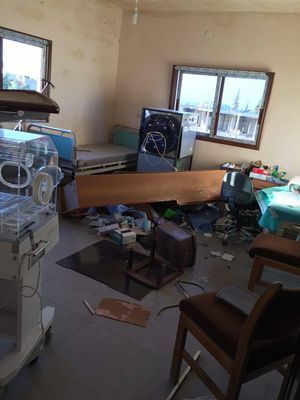 Yesterday, a SAMS facility near Sarmin, Idlib was directly targeted. SAMS is saddened to report that two of our medical staff, a physiotherapist and a nurse, were killed in the attack. The facility has been severely damaged as well. SAMS condemns this attack. 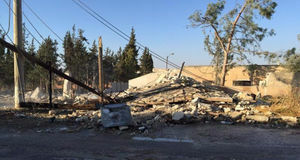 SAMS condemns all attacks on medical and civilian infrastructure. The international community must act to end these attacks. 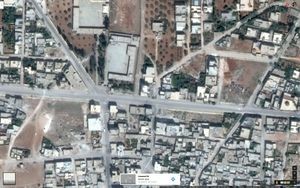 At least three hospitals have been bombed by fighter jets in north-western Syria since Russia’s intervention in the war began in late September, doctors and international observers claim. The first explosion destroyed the south wing of the abandoned school building and the small guardhouse on the left side of the gate. The second explosion destroyed the two larger guardhouses on the right. 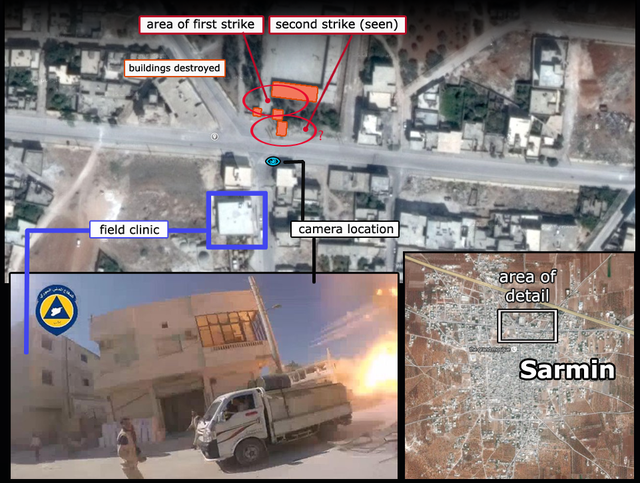 Location of attack in Sarmin on October 20, 2015 as seen on video: north center of the city, on the main road, left from center as labeled in the graphic above (revisions as needed). A fuller view of the scene, inset at right, helps verify this location (note the minaret visible to the east, etc.). 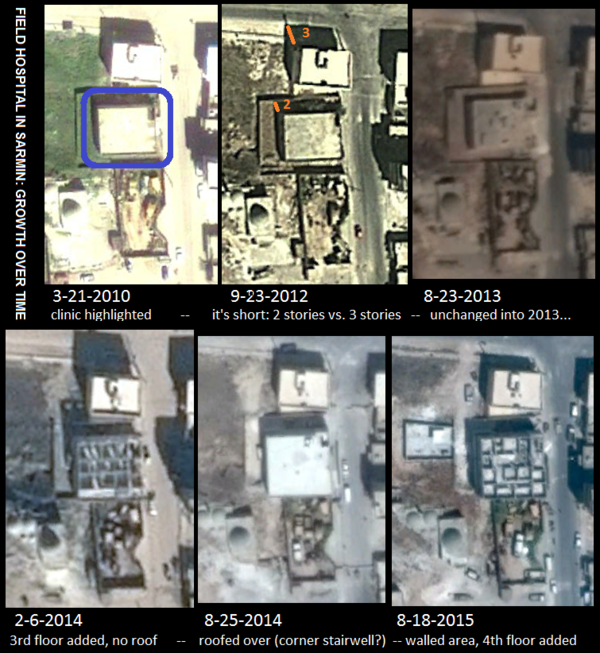 The field clinic (matched with other videos of this famous but previously un-placed facility) is highlighted above, compared to the four destroyed buildings in two strikes. These were at the south end of the abandoned school across the street (see images below at right, and compare). 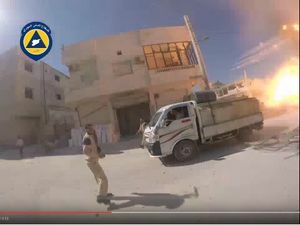 The video is filmed after the first strike and at the moment of the second one, about 10-15 meters away from the cameraman. The lucky cameraman just happens to be filming when the bomb hits. Was this a real Russian bomb, or was the whole video staged? Shows one wounded White Helmet member. Another man is lying on the hospital floor, possibly dead. Wherever it is, it's a total match for the clinic. Waiting room is a match, and the doorway - see 4:20 in night-time video, looking out: on the left side of the doorway an extra panel, and outside a wall to the left. Both in the new video, 0:44 and 0:49. 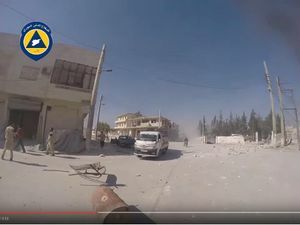 "Experts have questioned the authenticity of the video posted by the rebels, stating that it is physically impossible to film such a powerful explosion from a few meters away and survive. “It didn’t look like an aerial bomb dropped from an airplane. It appeared to come from an angle and the angle of the explosion appeared to be more like artillery,” a former policy analyst for the US Defense Department, Michael Maloof, told RT. Defense Ministry invited military attaches of the United States of America, Great Britain, France, Germany, Italy, Saudi Arabia, Turkey and NATO and requested for official justification of the statements or refuting them. It was particularly in regard to flagrant accusations of “hitting” hospitals published by several English-speaking media agencies...The defense department of Russia is looking forward to receive the necessary explanations in a few days. Video shows al Nusra logo. Seems to be between first and second strike. The small guardhouse at the gate has disappeared. The western end of the southern wing of the school has collapsed. Also the two larger guardhouses east of the gate seem to have disappeared. This page was last edited on 20 March 2017, at 07:34.